E3D-v6 hotend has poor design for printing 3mm PLA using Bowden extruder? Discussion in 'E3D-v6 and Lite6' started by Vladimir, Apr 27, 2017. I tried one original and two chinese E3D v6 hotends, also original Volcano hotend with 0.6mm nozzle. 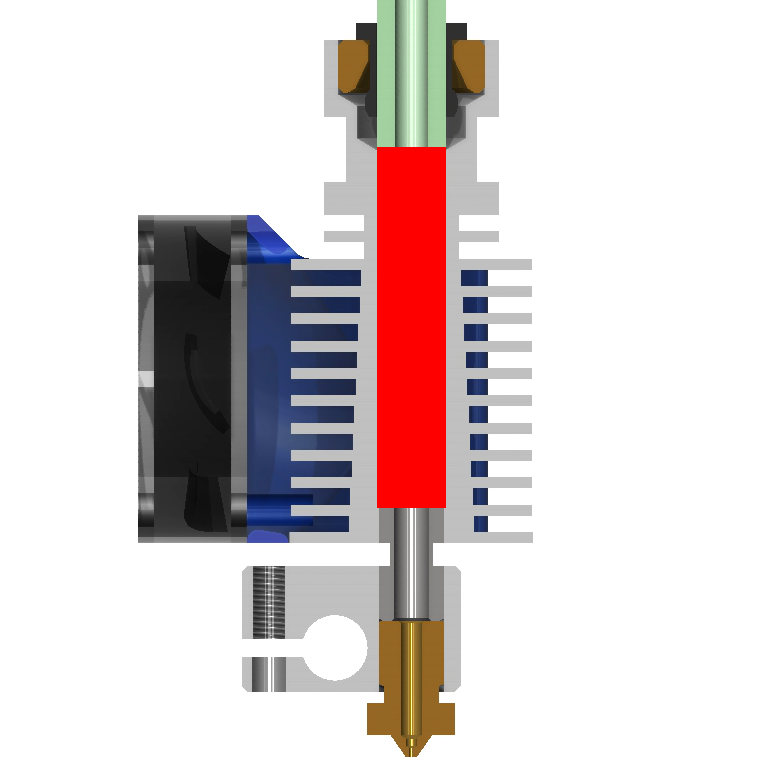 All of them have the same symptom – plastic gets stuck after a while (from several minutes to hours) producing a jam inside the hotend. My printer has a Bowden 3mm extruder and a heated bed (70°C for PLA). Powering hotend fan from 16V instead of 12V. Hotend radiator is slightly warm to touch. Putting extremely powerful motor in the extruder (6.5kg·cm). Various printing temperatures and speeds. Is all-metal design defective for printing PLA? Are there any other options I may try? Are there good hotends guaranteed to print PLA? And filled the hole with a piece of Teflon tube. I’m able to print with this hotend at speeds <30mm/s, but this is not what I want. My prusa i3 had a 3mm v6 Direct, then bowden, then direct, for nearly a year with no trouble at all. I switched it to 1.75mm Direct because I wanted direct, and wanted to have both my printers using the same filament (1.75). Again, no problem. Personally, I've had no trouble with any of my V6s other than one 0.4mm nozzle that was problematic until I replaced it. Printed lots of PLA, fair bit of ABS, Edge, various others (nGen etc). No hot end issues. Your experience seems to be different. I don't think the design is the problem here, but more likely to be something else. Is all-metal design defective for printing PLA? With such a great first post I'm sure you'll get plenty of help here finding out what you're doing wrong. Could you please help me explaining what i am doing wrong? My first guess would be too much retraction. If you're pulling the molten or even just very soft plastic too far up it can stick. Second option might be very poor quality material - if your filament is bad enough with enough variance in diameter or cross section, I suppose it could also jam - I've never seen that personally. Third possibility is poor assembly - you need to make sure you follow the instructions fully. You might of course have been unlucky and got a bad example. Can happen with any item from any company, but far more likely in my opinion from a cheap knock off than a genuine part. The design is actually very good - and I've put a lot of PLA though mine, as have many other people. I'd look at assembly and settings/usage, as well as filament quality. Those are likely to be the problem areas. Really its a case of work through each possibility until you find the right one - may be something I haven't thought of, but someone somewhere will have encountered it at some time. Its not the design though. Hotend radiator is slightly warm to touch.